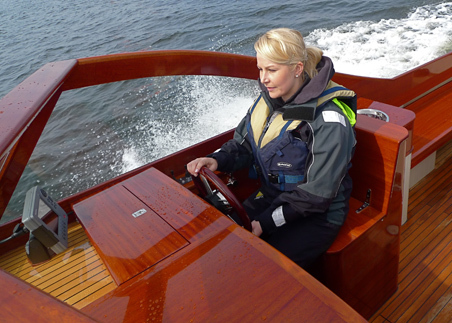 The Finnish Wooden Boat Center was founded to cherish the Finnish wooden boat heritage. The best way to maintain a tradition is, however, to create new traditions. That is why the Finnish Wooden Boat Center has the honor to host the Red Sky boat yard, which also creates new pearls for the next generation, besides restoring old ones. Wood is a living material. A wooden boat, like a person, ages gracefully with good care. With all it's minuscule details, a wooden boat only gains in character as it ages. We have noticed that people who visit us cannot help but caress the varnished wooden boat deck. No modern material creates the same primitive sensation than that of smoothly varnished wood. We strive to actively develop the wooden boat culture to reflect the demands of the future. 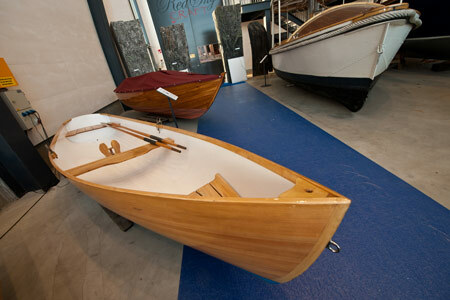 A modern wooden boat is more practical than its predecessors, and as practical as other modern materials. Without having to compromise on beauty. 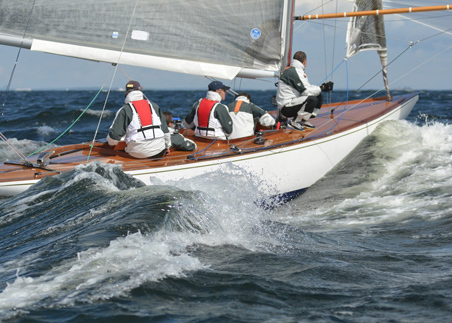 We understand how much passion and love an owner directs towards his wooden boat and we want to help the owner to understand and develop his interest in wooden boats. That is why the Finnish Wooden Boat Center is also open for the public during working hours. Without an entrance fee. Because we are united in our passion. The building of wooden boats started at the current location of the Center approximately ten years ago. In the fall of 1999, the Kalarannan Konepaja engineering workshop, which had been operating in Kotka Harbor for decades, moved to a new location in Mussalo, and the Kotka Wooden Boat Center cooperative, which was established at that time, took over the buildings. Majority of the cooperative society’s members were boatwrights who had graduated from the nearby Hamina Wooden Boat School. 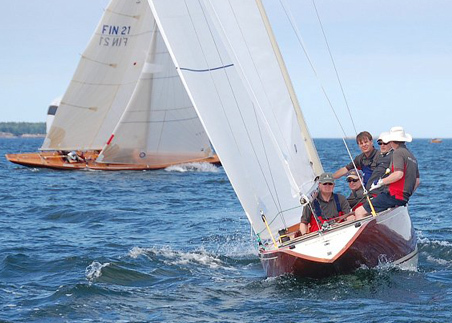 The City of Kotka, which had successfully organized three international wooden boat fairs back in the 1990’s, had supported the starting of the cooperative by repairing buildings as well as renovating land and water structures. The well-known wooden boat enthusiast and six-meter sailor Henrik Andersin became interested in this concentration of wooden boat know-how in Kotka. 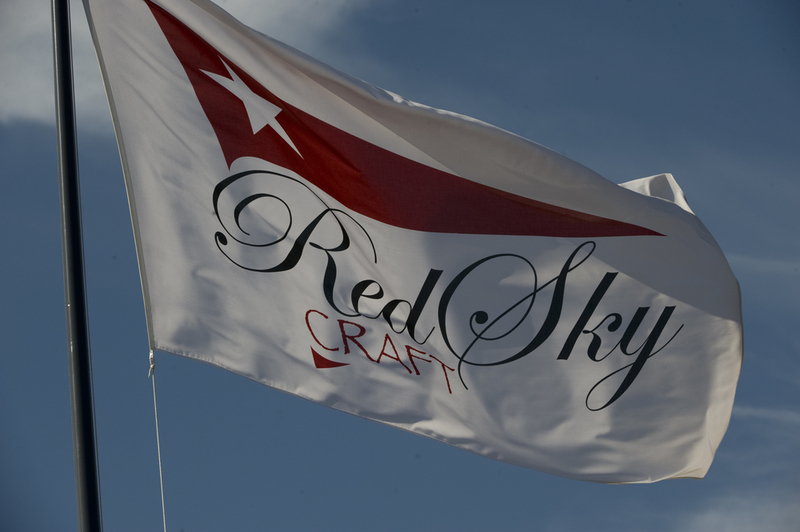 In the spring of 2004, he and a few members of the cooperative established the boatyard Red Sky. Over time, most of the other boatwrights had moved on, and the activities were declining. In the fall of 2006, Henrik Andersin bought the 1938 classic 12mR racing yacht Blue Marlin, designed by Charles E. Nicholson. The boat was brought by special transport across Europe from Slovenia to Kotka, and the search began to find an appropriate place for her renovation, which would take a number of years. In the spring of 2007, Mr. Andersin made an offer for Kotka’s Wooden Boat Center’s property. The City accepted the offer and rented the land and water areas to Andersin on a long-term lease agreement. The old facilities, however, were not adequate for the renovation of the Blue Marlin. The Architects Lahdelma & Mahlamäki, designers of the new Maritime Center Vellamo in Kotka, drew a new, modern boatyard for the Wooden Boat Center’s property. At the same time, the Center’s old facilities were fully renovated, and a strong hoist dock was built. Lt. Col. Leo Skogström, who had done a lot for wooden boats in the 1990’s, was hired as Project Coordinator. Construction work began in the beginning of August 2007 and, and the project’s main construction company was YIT Corporation. The work was completed on time, and the inauguration ceremony took place on May 21, 2008. The building of wooden boats in Kotka now had a strong basis for its future. The Finnish Wooden Boat Center is an integrated 1.5 hectare area in Kotka’s Cultural Harbor, near the Maritime Centre Vellamo. The Boat Center’s appearance is dominated by the copper, arch-shaped roof of the boatyard. However, the Center also has a lot more to offer. The Finnish Boat Center services boatbuilders, people dreaming och wooden boats and everyone who is interested in wooden boats. We build, fix, maintain and dock boats. During working hours, everybody is welcome to follow our work. Red Sky boatyard, one of the premier boatyards in the country, is at the core of the Wooden Boat Center's operations. Established in 2004, Red Sky specializes in repairing classic boats, designing new wooden boats and boat building. The boatyard’s Managing Director is boatwright and designer Allan Savolainen. The company currently employs a dozen workers, making it Finland’s largest wooden boat yard. T:mi Köysityöt M. Kajander is a boatbuilder from Kotka that does rope and boat carpentry. The company VENEKUOMU MA-RE produces boat canopies. The Finnish Wooden Boat Center's main attraction is Henrik Andersin's renovated classical 12mR-class racing yacht Blue Marlin. 12mR was the class of the America's Cup from 1958-1988. The legendary boat designer Charles E. Nicholson from england designed and built the boat for Charles Hartridge from England. The boat is over 21 meters long and it has been renovated in the spirit of its time. 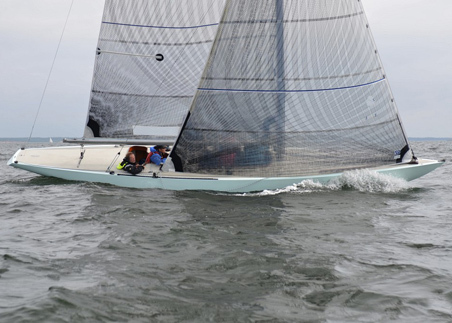 Djinn was originally built by Henry B. Nevins Boatyard in New York for America's Cup Hall of Fame honoree Henry S. Morgan, Esq. Cabin removed 2007 and new sitkaspruce deck was built like it was in Harry Becker's original drawings. 2009 she got new sitka spruce racing mast with stainless steel fittings. Mast height is 14m and weight is 63kg which is class rule minimum. Ian was the last 6mR Estlander built for himself. It won the Gold Cup in 1930 and was for years one of the most successful sixes in Sweden. She has been completely restored to original specification. Aili Hanell is a transport vessel that was renovated for the yacht club Esbo Segelförening to be used between the Amiral Harbour in Esbo and Pentala Iland during summer. ...and we do have other friends. Remember to like us on Facebook. Easy to manoeuvre, ideal for picnics. 4,1 x 1,3m, weight 65kg. 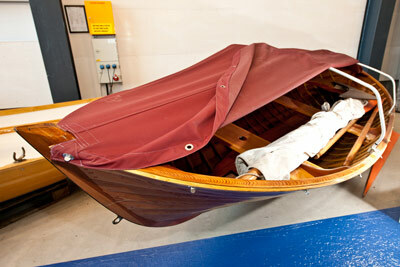 The boat was build using a method that was patented by Eddie Cutts. The boat was built using a two layer. Inside is of aspen, outside is of pine. The arches are of kevlar-weave, which is laminated into the aspen grooves. Kevlar has 10 times the strength of steel. The boat comes with oars, oarlocks and boat cover. Boatmaker: Jarno Ruhtinas, from Kotka 1995. Boatmaster Poju Suntio (1941-2010) from Vehkalahti built in year 1990 and 1992 two similar dugouts, which one was donated to King Carl XVI Gustaf from Sweden as he visited Kotka. To boat comes with a rudder, sail with equipment, a removable steel keel, oars and an aluminumarched boat cover. Clinker-built ship boat, 3,8 x 1,4m. Pine. Designer unknown. Boatbuilder Hannu Tyrni, from Pyhtää 2009. The RedSky-boatyard renovated a sail dingy that was found in bad shape in Heinlahti for the Kymenlaakso museum, where it is now visible to the public. Hannu Tyrni built an exact copy of this boat.